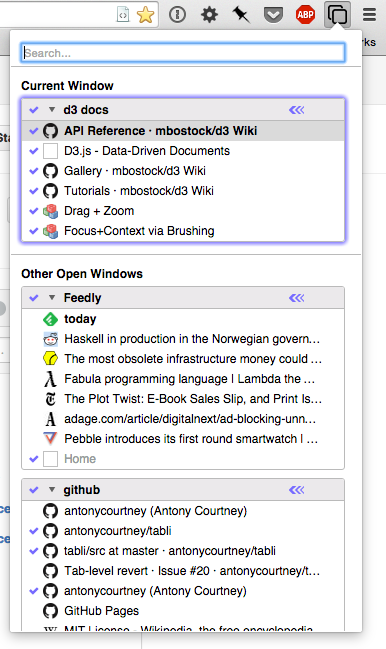 Manage everything at once with Tabli. Simple. Effective. Efficient. The core functionality of Tabli is a popup window which shows a searchable, scrollable view of all your browser windows and tabs. Quickly and efficiently navigate through your tabs without your fingers ever leaving the keyboard. Find out more on the usage page. Have a bunch of tabs related to a subject you want to view later? Tabli supports saving and restoring sets of tabs as saved windows.